KevinMLD: I find it interesting the Marvel’s new status quo for the Hulk is to give him basically a new Planet Hulk below the Earth’s surface. PTB: I couldn’t help but be reminded of the Hulk’s experiences on Sakaar when we see him deep below the Earth’s surface fighting monsters. His relationship with the Moloids is particularly reminiscent of the Green Scar’s interaction with Miek’s insect people. KevinMLD: I also find it interesting the amount of empathy the normally hunted Hulk shows for his prey now that he’s a hunter. It’s a nice touch. PTB: I think it fits nicely with the Hulk we sometimes see even if it’s not normally articulated to this degree. KevinMLD: Are the subterranean people he feeds new characters? PTB: No. They are kinsmen of the Mole Man’s Moloids first seen in 1963’s Fantastic Four #1. There are many clans from what I understand and this one has been isolated from the surface for centuries at least. KevinMLD: That makes sense. I wasn’t sure how their comments regarding lack of contact with the surface fit with the previous appearances by mole people. It’s clear experience has taught the Hulk that it’s only a matter of time before someone finds him. That’s kind of sad though too. PTB: The sense of dread and inevitability was really well presented. Again, much like on Sakaar, the moment the Hulk lets his guard down he finds himself under siege. KevinMLD: I’m not sure how I felt about the level of coincidence involved in him finally coming down from his post and suddenly being attacked. It’s a little weird. I guess he could have already been under surveillance, though we’re given no reason to believe that. Silvestri’s figure work while drawing the Hulk rampaging on the U.S. government forces is amazing even if the backgrounds leave something to be desired. PTB: The stark background helps to focus whats happening on the panel, but I’d prefer more detail. I’m not so crazy about the scratchy line work here compared with the cleaner style we’ve seen from Silvestri in the past. KevinMLD: I was a little surprised by how scratchy it was, but I liked it. If Amanda Von Doom is really no relation to Victor, that’s idiotic. PTB: That has to be a joke of some kind. I’m not sure it’s a good idea to invoke Doom here and not use the character himself. KevinMLD: The fact that Banner has taken to conducting experiments on the entire population of animals on the island he’s living on is just creepy. I’ll be curious to learn what the point of it all is. PTB: It’s very Doctor Moreau and I have to believe there’s more to it than meets the eye. Banner must need Hulk for something important or maybe Hulk isn’t as free as he appears and Banner is trying to rescue him. The octopus and the crab in the bag of captured animals were identical (albeit smaller) to the ones Hulk is fighting in the opening pages. KevinMLD: The similarity between the animals being gathered by Hulk and 26 and 27 (at least in the bag on their right) cannot be a coincidence. As for the Hulk being free… He’s NEVER free. PTB: This is true. I also couldn’t ignore how well spoken Hulk and the Moloids are compared to 26 and 27’s speech patterns. 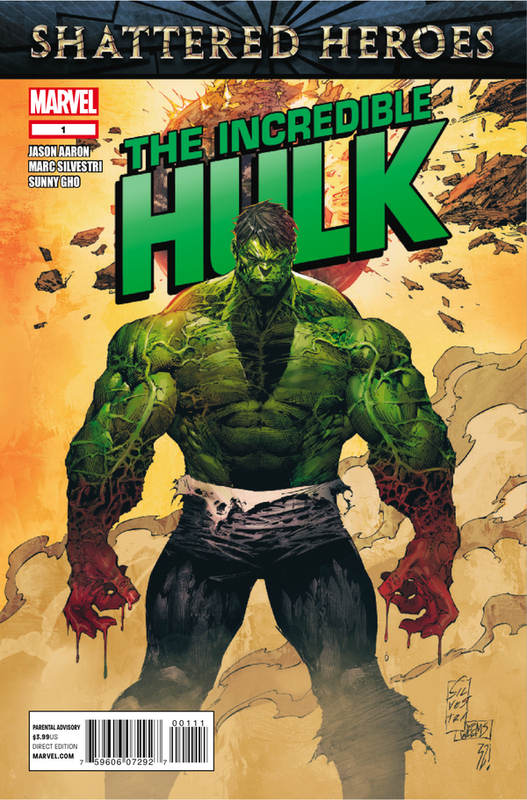 KevinMLD: Overall, Jason Aaron’s Incredible Hulk #1 is a solid read. I would argue it’s definitely not worth $3.99, but I’m happy Aaron is focusing on the Hulk-Banner dynamic as its been ignored for too many years. PTB: I’d come back for a second issue of this. Aaron has had some longer arcs with decent payoffs from what I’ve heard and I’m intrigued by this one. Plus I’m a Mark Silvestri fan. KevinMLD: I’m curious how long this takes place after Fear Itself #7, because it seems clear a great deal of time has passed. I wonder if any effort will be made to sync any of this timeline with Defenders #1. PTB: I’m afraid having Hulk in two ongoings could turn into a Red Hulk level mess. KevinMLD: Well plenty of characters appear in multiple books on a monthly basis without too many problems. 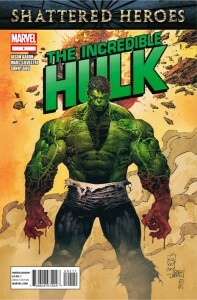 It’s just that this Hulk seems so different from the one who appeared in the Defenders preview in Fear Itself #7. Speaking of how different this long haired Hulk is, he reminds me a little too much of Skaar for my taste. 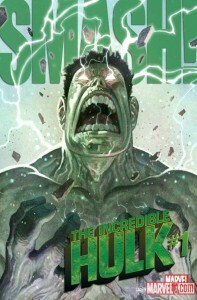 However, Silvestri nails the Hulk’s body language, size, and movements. PTB: I like the design, particularly the necklace and beard. Is Skaar still in the Savage Land? KevinMLD: The last I heard he was still hanging out there. I hope Banner has some of the nasty streak he displayed during Pak’s run while the Hulk was supposedly destroyed for good. That was Pak’s best work in my opinion. PTB: I didn’t read beyond Hulk #600 and at times I wish I had. I loved what Pak was doing until that point and I feel like it ran square into Red Hulk and went off the rails. KevinMLD: In the text pieces in the back of the issue, Jason Aaron mentions that fans can expect an answer to “the question of just how exactly did Hulk and Banner get split apart and who in the world could have possibly made that happen.” I’m glad that there’s apparently more to their separation than what we saw in Fear Itself #7, but I hope that scene is not totally ignored. PTB: This is one of a number of mysteries I’m anxious to see play out in this series.